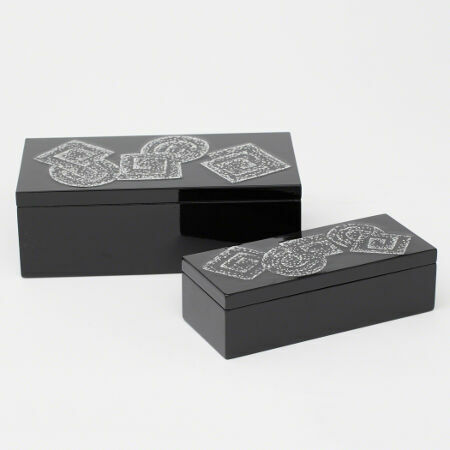 The Quandary Box can be used to center a tablescape or organize and disguise clutter on a desk or bedside chest. It is part of a series of boxes offering a study in harmony and contrast. Motifs reflect early influences such as spirals drawn by early man at the dawn of two-dimensional expression, or the fluted shapes used by classical architects. The choice of material is inspired by some of Roger's favorite designers and artisans: Frenchmen working in the first third of the 20th century who used contemporary materials to define new concepts of modern, luxe and chic. The intricate mosaic inlays result from the application of hand-crushed duck eggshells in a precise pattern onto the lacquer half-way through the lacquering process. Each box is hand crafted by artisans, so no two are exactly alike. Large (RT7.20012) 10 1/2″l x 5 1/2″w x 3 1/2″h. Small (RT7.20013) 4 1/2″l x 3 1/2″w x 2 1/2″h.